Are baby slings as safe as you think? There is a very important safety lesson to be learnt from this British mother's devastating experience. UK mum Marianne Matthews was only trying to get her four-week-old baby boy Eric stop crying. So like many mothers would do, she placed him in a sling and took him for a walk. She never knew she was about to make a huge mistake. She never thought this would be the last time she saw her precious baby alive. In a heartbreaking post she wrote on Rospa.com, she pleads with other parents not to make the same mistake. Marianne explains that while she was walking with her little one in the sling – which was a stretchy wrap sling and came with minimal instructions – she started nursing him as he got hungry. When she got home, she noticed that her baby had stopped breathing, and he was bleeding from his nose. “Everything happened so quickly and quietly I didn’t realise that something was very wrong. He had either choked or got into difficulties. By the time I got back, he had stopped breathing,” she said. She immediately rushed her baby to hospital, but it was too late. Eric had died. While this sad incident happened in 2014, the safety message it carries for all parents is timeless. In fact, all the baby books she had read advised that when it came to baby carriers, a fabric sling was one of the safest options for newborns as it enabled them to be held snug against their mother’s chest. Marianne’s heartfelt plea to other mums is to never multi-task while carrying an infant in a sling, especially when it comes to breastfeeding. She also urges parents to only buy baby products from reputed brands, and that come with clear safety instructions and warnings. Marianne and Bob Matthews have celebrated the birth of daughter Sola Eden since the tragedy. Source: RoSPA. Paediatric pathologist Dr Mary Malone, who carried out a postmortem on Eric, said the cause of death was asphyxiation, usually the result of incorrect positioning of the baby inside the sling. Death by asphyxiation when a baby carried in a sling is much more common than many think, when the baby is not placed properly within the sling. A study conducted by the Queensland University of Technology, that involved 800 Australian families, found that almost one in 20 babies have been injured or narrowly avoided injury in slings. What’s more, “of the 95 per cent of parents surveyed who said they used or intended to use a baby sling, the majority considered it safe to use the sling from when the baby is a newborn. “This is concerning because product safety experts don’t recommend baby slings for premature or low birth weight babies,” explains Dr Kirsten Vallmuur who led the study. When in a sling, you baby’s face should never be covered or pressed against your chest or the fabric. Why can slings be dangerous? 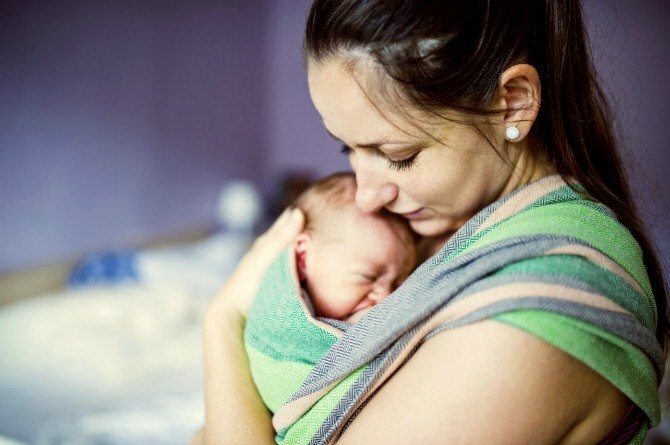 According to the Australian Competition and Consumer Commission (ACCC) babies placed in a sling are most at risk (when placed within it incorrectly) because they don’t have the ability to move out of a dangerous position that compromises their ability to breathe. Also, babies under four months, preemies, those with low birth weight or those with breathing issues appear to be at greater risk. Parents are also warned to avoid buying slings that are described as “womb-like” or “cocoon” which place baby back in a foetal position or cover him completely. “These slings place the baby in a dangerous position with a curved back. A foetus doesn’t need a straight back to breathe, but a baby does,” says the ACCC. Always do your research first before buying a sling. Read up on it and ask other parents for their feedback before purchasing it. Double-check your baby’s weight against the maximum weight that can be carried in the sling. Avoid breastfeeding whenever possible while baby is in the sling. If you must nurse, ensure your baby has your full attention while he is nursing, and you change baby’s position afterwards so his head is up and not pressed against the sling. Avoid bending at the waist with your baby in a sling. Bend at your knees instead, which will keep baby secure in the sling. Watch for signs of wear and tear in your sling, and repair them without delay. We hope you’ve found this article informative, as sad as Marianne’s story is. Do share this article with any parents you know who have newborns.